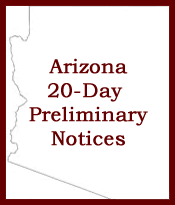 If you need the Arizona 20-Day Preliminary Notice Form but not the information below here then please click here. The Arizona laws are very strict on what a preliminary notice is supposed to 'say', the text of the proof document, the timing of service, etc. It'll be returned to you as 'unclaimed'. Keep that returned mail (every bit of it including the envelope itself) as the 'proof of service documentation' and, as required by law, attach it to your Proof of Service Affidavit. The law allows you your full lien rights under the preliminary notice even though it went unclaimed at the post office because it's considered as having been properly served. But you have to have followed all of the requirements, every last one of them. The preliminary notice protects your lien rights going back as far as 20 days from the date you serve the notice, and then it stays in effect through the end of the project meaning you'll have mechanic's lien rights for the rest of the project. If you started on the project longer than 20 days ago you still must to do the notice. If it's been 30 days since you started the project then it's only the first 10 days that won't be covered (because the notice protects up to 20 days prior to the date it's served). If you miss it by a day or two then it'll be that day or two that won't be protected. If you completed the project longer than 20 days ago then chances are you won't have any lien rights on the project whatsoever. But don't take my word on it, be sure to speak with an attorney (it's free here). So make sure you do your preliminary notices and that you do them in a timely manner - preliminary notices are one of the first things you must do when starting a project - or you might not get paid. If you're involved in a project where you're supplying labor and/or material and/or services and/or machinery and/or some fixtures and tools (there are exceptions) and/or machinery, you need to do a preliminary notice to protect your lien rights. Pretty much the only 'entity' that doesn't have to file a prelim is the paid employee. So unless you're an employee employed by the construction company you'll be required to serve a preliminary notice. Property/home owners are getting savvy about the various laws and regulations and those that are less than honest use the lien laws to get out of paying their contractor(s) - and it's legal if the contractor didn't do the prelim. Unfortunately there's always someone that will take advantage anywhere and everywhere they can. So many people think that the contractor is *always* the bad guy when a 'situation' arises on a project but there are plenty of times when it's the home/property owners burning the contractors rather than the other way around. It is *very* important to your business, your sanity, your livelihood, etc. to keep yourself aware of the various laws - even if for no other reason than there's a good chance your customer knows them or will learn them during the project (and you might get stuck with one of those 'less-than-honest' property/home owners). Before anything I should let you know in case it's not a common 'slang' word with contractors in Arizona, a lot of times the Preliminary 20-Day Notice is referred to simply as a prelim. I'll end up doing that a lot within this article. A general description of the labor, professional services, materials, machinery, fixtures or tools furnished or to be furnished and an estimate of the total price thereof. The name and address of the person furnishing labor, professional services, materials, machinery, fixtures or tools. The name of the person who contracted for the purchase of labor, professional services, materials, machinery, fixtures or tools. A legal description, subdivision plat, street address, location with respect to commonly known roads or other landmarks in the area or any other description of the jobsite sufficient for identification. A massive statement to the Owner along with a special notice, all of which explains to the property/home owner what an Arizona 20-Day Preliminary Notice is (and that it's *not* a lien). I was really surprised to discover that with the next requirement Arizona has actually surpassed California in regard to the 'toughness' of the lien law! 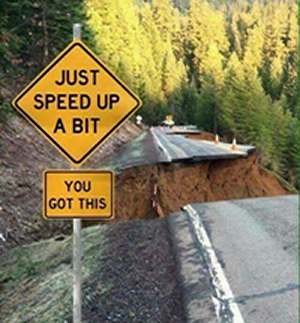 California is *usually* one of the toughest states on requirements for contractors and their paperwork. Contractors are required to include specific text on their preliminary notice that the Owner fills out and sends back to the claimant (the contractor). The law gives the Owner a limited amount of days to acknowledge receipt of your preliminary notice. He's also required to notify you of any inaccuracies in your prelim notice. In addition if there's a bond involved then he's also required to notify you of that including the bond company, number, etc. The requirements for the Owner's acknowledgement of receipt, that you're supposed to include on/within your preliminary notice for the Owner's use, differ depending on what section of the law you're looking at (both sections - 33-992.01 & 33-992.02 - are about preliminary notices). Within ten days of the receipt of this preliminary twenty day notice the owner or other interested party is required to furnish all information necessary to correct any inaccuracies in the notice pursuant to Arizona Revised Statutes section 33-992.01, subsection I or lose as a defense any inaccuracy of that information. 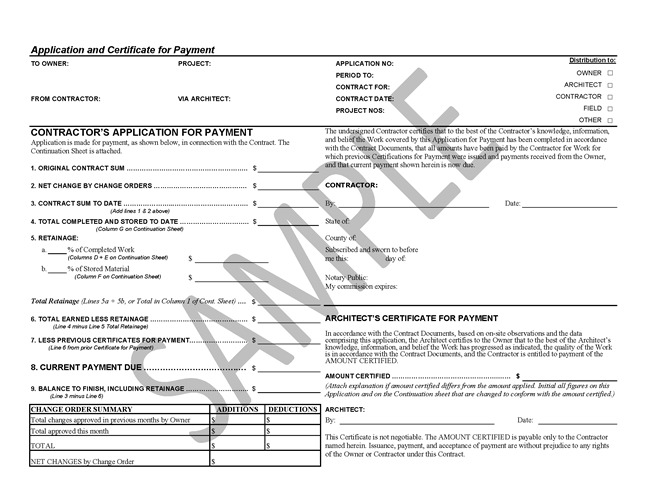 Within ten days of the receipt of this preliminary twenty day notice if any payment bond has been recorded in compliance with Arizona Revised Statutes section 33-1003, the owner must provide a copy of the payment bond including the name and address of the surety company and bonding agent providing the payment bond to the person who has given the preliminary twenty day notice. In the event that the owner or other interested party fails to provide the bond information within that ten day period, the claimant shall retain lien rights to the extent precluded or prejudiced from asserting a claim against the bond as a result of not timely receiving the bond information. If the Owner fails to complete the acknowledgment or fails to complete and return the acknowledgment within thirty days then he can't use the prelim as an acceptable argument. However the wording on the preliminary notice that's for the Owner, as required by 33-992.01, lists only the 10 days for errors and the 10 days for providing information regarding any bonds. It does not require that the statement about the 30-day deadline be included. Within ten days of the receipt of this preliminary twenty day notice if any payment bond has been recorded in compliance with Arizona Revised Statutes section 33-1003, the owner must provide a copy of the payment bond including the name and address of the surety company and bonding agent providing the payment bond to the person who has given the preliminary twenty day notice. In the event that the owner or other interested party fails to provide the bond information within that ten day period, the claimant shall retain lien rights to the extent precluded or prejudiced from asserting a claim against the bond as a result of not timely receiving the bond information. That's it; there's nothing within the government's required text about the 30-day failure to reply keeping the Owner from using the prelim as a defense - which in essence gives the contractor full lien rights no matter mistakes. This does however assume that the prelim *was* served as required. These issues beg the question - what should be included in the Owner's acknowledgement section? If the part about the 30 days and the Owner losing the defense of the preliminary notice is *not* included, might that cause a problem in the trial (Owner: "Your honor, nothing told me that I had to respond within 30 days") - even though the law didn't require you to include that information? If an addition is made to the document to inform the Owner of the 30 day deadline will that invalidate the document? The requirements in the law state that the form must follow 'substantially' what's written in the statutes. Adding that statement about the 30 days doesn't in any way alter the 'substantial-ness' of the document and indeed provides additional value to the document (because it provides additional, pertinent, information to the Owner). Here's my #1 recommendation as your resource for a downloadable, fill-in-able, savable, reusable Arizona 20-Day Preliminary Notice form. Can you still lien the property? *Don't be nervous about getting the prelim info from your customer. 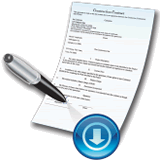 *Make sure your preliminary notice form has the correct text or you may end up without lien rights. Please note that this article is currently out-of-date and needs to be updated. *The preliminary notice form itself can be a photocopy but the signature must be original or "wet"
*You've issued your preliminary notice and now your customer is increasing the amount of work he wants done. Should you amend your preliminary notice by sending another one? *The Owner filed a Notice of Non-Responsibility. Should the contractor/supplier still send the Owner a preliminary notice? *Do you need to include a dollar amount on preliminary notices or can you send it without a dollar amount? Arizona's laws are very strict on what a preliminary notice is supposed to 'say', the text of the proof document, the timing of service, etc. What you don’t know about the pesky preliminary lien notices can hurt you. Preliminary Notices: Don't Get Stiffed! It's YOUR responsibility to let everyone know that you have a financial stake in the project - don't stiff yourself! At one time this form was mandated by California to be titled "20-Day Preliminary Notice Form". The California mandate has since changed and the form is now known as the "Preliminary Notice Form". Each state that requires this type of notice will have its own requirement in regard to the title of the form. 6. Who gets a copies of your Arizona 20 day preliminary notices?